Feature 1: Ideal and Perfect Outwear for Fall Jacket, Spring Jacket, and Winter Jacket. 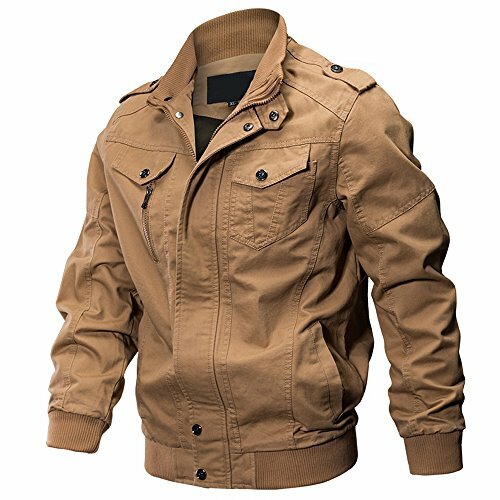 Feature 2: Casual outdoor coat windbreaker jacket is inspired by army uniforms and practical classic work wear. Feature 3: The side pockets are ample sized and the left chest pocket is big enough for a pack of cigarettes or a smaller cellphone if you wish the pocket flap closed. Feature 4: It has an inside pocket that is quite large and will hold the biggest cell phones in any case. Feature 5: The zipper pocket does provide balanced design appearance, it will hold a thin ink pen, pencil or a thin ecig battery with a refillable cartridge attached. 1. There could be a difference of 1-3cm (0.39-1.18inch) due to manual measurement. 2. There might be a slight deviation of color due to the different displays. 3. When selecting size, please take into account your body type. like lanky type, chunky type, bellies. ◎Please choose one size up if for stronger men, bellies men or the person who likes loose style. Please don't hesitate to contact us if you have no idea of the size. There is another seller who sells the jacket under our listing page, but according to the feedback in his store, he has never shipped the orders, please attention to it!! !